Offering style and functionality Rangemaster wine coolers are products of immaculate engineering. 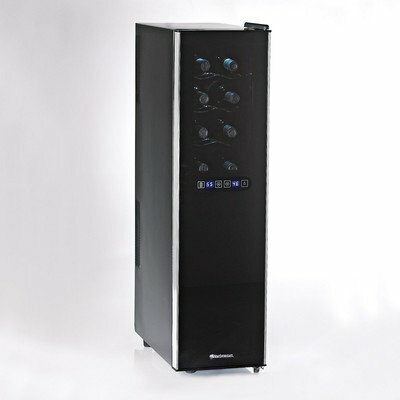 These wine refrigerators offer a great solution for storage of your exclusive collection of wines. Moreover, Rangemaster ensures that highest quality control standards are maintained for every component; the brand lives up to its name. Designed to enhance your kitchen’s décor, and to store your wine within appropriate conditions, the Rangemaster wine refrigerators can easily fit under any kitchen worktop. Whether it is red or white wine, these refrigerators store your wine at stable temperature and humidity. The wine cabinets are available in a range of colors including matt black, stainless steel and cream. Rangemaster wine refrigerators are capacious and offer enough space to hold 50 standard size bottles. It has dimensions of 606 mm x 864 mm x 616 mm (W x H x D). 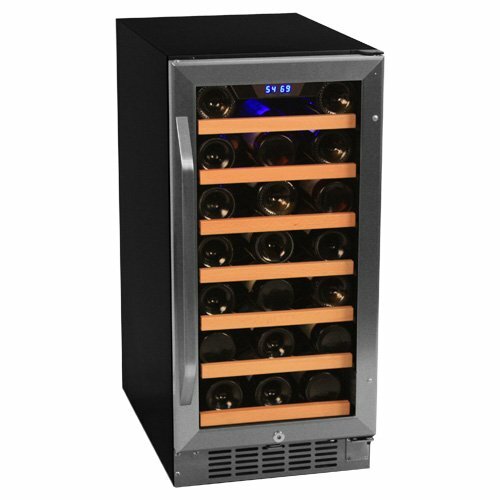 The wine coolers come in three door colors – matt black, cream and stainless steel. However, the deluxe version is available in stainless steel and black only. The design of the refrigerators perfectly complements that of the Rangemaster cookers. Chrome shelf finish adds a chic look to the appliance. The plinth is made of black metal grill. Equipped with left or right-handed reversible door. The interior light can be set automatically or manually. The light can remain on constantly or turns on when the door is opened. Offer consistent humidity level between 50% and 80%, which is ideal for storing wine. With an auto-defrost system, there are no chances of ice build-up in the cabinet. It does not require a rear ventilation gap. The body incorporates extra thick, high impact polystyrene vacuum and heavy-gauge metal in the walls, which ensures better insulation and durability. Rangemaster wine cooler attaches a large double-pane picture window which displays wine collection superbly. The window also acts as a UV filter keeping off the harmful light rays and securing the wine. However, what makes it attractive is the door handle trim finished in chrome or brass. Rangemaster wine refrigerator features auto defrost cabinet that maintains perfect and constant temperature between 10ºC and 14ºC. This can be adjusted between 5ºC and 18ºC. Being a fan cooled refrigeration system, the wine cooler enables faster temperature recovery, as and when the door is opened. It also helps in air circulation protecting the wine from being tainted. It incorporates fan motor, evaporator and premium compressor, which ensures lesser maintenance and longer-life. Moreover, the shock and vibration dampener mountings ensure a vibration-free environment. Electricity consumption of these 50-bottle wine cooler is around 250 W/day which is rather low. The smoothly gliding deluxe shelves make it easier to store the wine fittingly. The interior light can be kept on constantly or whenever turns when you open the door. Price: £ 600 – 700(£ 12-14 per bottle). Rangemaster wine coolers are available in UK-based stores. 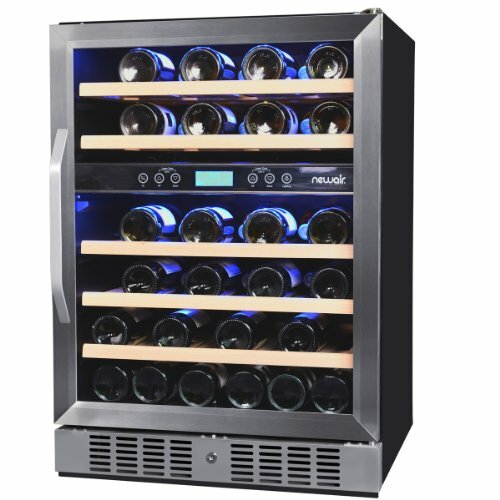 TIP: take a look at Haier Aficionado Wine Cellars, there’s a similar 50-bottle model with dual temperature zones. Liebherr Wine Coolers – quality wine refrigerators that reflect German accuracy and reliable operation. 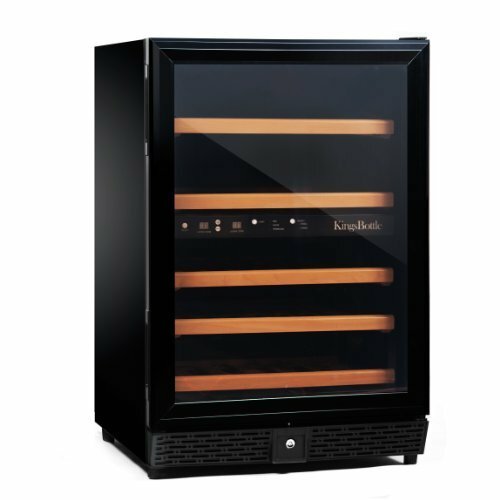 Caple Wine Coolers – affordable, reliable and attractive wine cabinets made in Great Britain. Transtherm Wine Coolers – the French-based company has established a name in the wine storage industry during its 25-year operation. 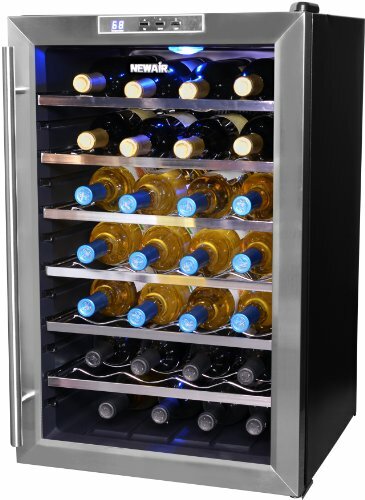 Samsung 31-bottle Wine Cooler – a cheap home wine cellar for wine lovers in the UK.